The roasted pumpkin salad had got me thinking about using fall ingredients in light spring like meals and the next thing that I was thinking of was a pumpkin soup and I knew exactly which one I was going to make. There was absolutely no way that I could resist trying this pumpkin and shrimp bisque recipe from epicurious; I mean it combined my current obsession, pumpkin, along with one of my all time favourite foods, shrimp! I have a perfect recipe for a shrimp bisque but it is a little bit on the decadent side and this pumpkin and shrimp bisque is nice and light and healthy, comparatively speaking. This recipe starts off by making a shrimp stock and if you are like me, this is exactly the time to pull out those shrimp shells that you have been saving in the freezer for just such an occasion. From there you add the pumpkin puree , a bit of heavy cream and some simple seasonings and you are done. I served the pumpkin and shrimp bisque with a quickly assembled sage gremolata which added an amazing brightness to the bisque and a rocket salad with feta and walnuts rounded out a really nice light fall meal! Heat the oil in a pan at medium-high heat. Add the shrimp shells and cook until they turn pink and then just start to turn brown and fill your kitchen with the aroma of shrimp, about 3-4 minutes. Add the white wine and simmer until it has evaportated, about 4-6 minutes. Add the broth, saffron, onion, carrot, celery, bay leaves, and sage, bring to a boil, reduce the heat and simmer, covered for 30 minutes. Strain the solids from the stock with a fine metal sieve and return the stock to the sauce pan. Mix in the pumpkin puree, heavy cream and cayenne and simmer on low heat for 10 minutes. Add the lemon juice and season with salt and pepper. Add the shrimp and saute at medium heat until cooked, about 2-3 minutes. Divide the shrimp between 4 bowls, pour the bisque over them and garnish with the sage gremolata. this soup has such a lovely color! i would never think to use pumpkin and shrimp together, but it looks super yummy! Lovely! Shrimp bisque has been on my to-make list for a while, and I love this fall version. Sounds fabulous! I haven't had bisque for years! Yours looks really good. I'll definitely should try this out. I'm not familiar with the term gremolata. Could you tell me what sorts of dishes are appropriate for this blend? Thanks! THe pumpkin shrimp combination sounds absolutely perfect!! And it's super pretty, too 🙂 Soup is usually hard to photograph and yours looks awesome! Oh what a nice combination! It sounds fantastic! As soon as I finish the second week of South Beach, I am going to make this soup – thanks Kevin! Geez Kevin- for the past week I have been researching recipes for my crab shells that I have int he freezer. I think your soup is just the ticket. Crab and Pumpkin Bisque. Stellar! Kevin….you made what has to be the best soup ever. 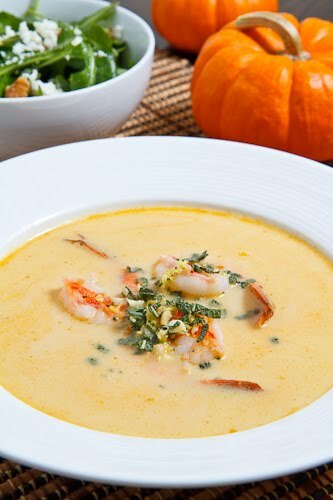 I simply love pumpkin and shrimp and can only imagine that the 2 of them in a soup is just lovely. I already had an obsession with pumpkin and shrimp, but it's officially become a frenzy. You da bomb dot com. Jeffrey and Juli: I have just started getting into gremolata and so I am still experimenting. It is more commonly made with parsley and I have enjoyed that version on dishes like this Osso Buco where I found that the bright flavours of the gremolata went particularly nicely with the intense flavour of the veal in its tomato sauce and with the creamy risotto. Fantastic recipe and your photograph is beautiful. I've made this exact recipe before and just love it as do guests. A great starter for Thanksgiving meal here in U.S.
What a beautiful and elegant soup… delicious. What a great combo. I've made a pumpkin soup with shrimp before, but I went more along the lines of a curry / Thai flavor. It's interesting to see a more American traditional flavor profile with the sage gremolata. Nicely done! I love the Bisque family of soups and this is a great take on it. Love the seasonal flavors. I could really use a hot bowl right about now! Bisque is some serious comfort food. The combination of pumpkin and bisque sounds interesting. I'll have to try this out! This soup looks wonderful–it'll be the next pumpkin dish I attempt. Thanks! this has FALL written all over it!!! looks amazing…i need a few new soup and bisque recipes. thank you!!! This was really delicious! I was a little unsure about the gremolata, but it fit in perfectly! The only change that I made was to add the shrimp at the same time as the pumpkin and cream and let them cook in the soup. So Kevin, if you don't use shrimp shells, do you just start with the chicken stock? Linda Andrews: Yes, the shrimp flavour will not be quite a strong but it will still be great!